The US and Russia routinely engage in espionage at an insane level of effort and have since before World War II. Barack Obama famously made fun of Mitt Romney during the Presidential debates when Mitt said the Russians were bad hombres, but Mitt was right. Espionage is the effort to obtain secret information without the permission of its rightful owner. It is one part of the spy game. Espionage is conducted by spies who are engaged full time in trying to obtain the enemy’s secrets. This is how the Russians “invented” their nuclear weapons, they stole them from the Americans. The first thing to know is that people who engage in spying break the laws of the target country. So, when evaluating the spy operations, talking about you CIA, you are dealing with people who break laws for a living. Except, they are not supposed to break any US laws. The American NSA (National Security Agency) is the premier sigint entity in the world. It can listen in on and break into every form of communication known to man. It can capture and store every written or spoken word since the advent of language and store it all without breaking a sweat. Spies are not limited to obtaining information. Sometimes, spies are providing information to an enemy with the objective being to misinform, disinform, mislead, or confuse the enemy. In the vernacular of spies, these individuals — working on misinformation, disinformation, misleading or confusing — may be agents of influence, agents of confusion, and agents provocateur. In the Russian effort, it is these objectives which were in play. The Russians wanted to influence the American election and to confuse the American electorate. The Internet has changed everything. The killer app of the Internet is email. Writing emails can get you into a lot of trouble (talking to you Jon Podesta and Hillary Clinton). Counterfeiting emails can cause a lot of trouble. The American electorate can be communicated with using the Internet and Social Media. They will be studying the Trump campaign’s use of Twitter for the next century. The Russians, as all espionage agencies did, recognized the power of the Internet and Social Media to misinform, disinform, mislead, and confuse the American voter (writ larger, the entirety of American society not just voters). So, let’s stop for a second and ask ourselves a question – given the nature of the Internet and Social Media is there any way the Russians would NOT have been using them to engage in misinformation, disinformation, misleading, or confusion. It’s in their DNA. OK, so when did this start, Big Red Car? It started with the advent of the Internet and Social Media. It’s been going on for years. Though Mueller comes to us with breathless indignation as if he discovered gambling at Rick’s Place in Casablance, there have been a number of articles both in Russia and the US about a Russian troll factory. What you can see from these articles is that the Internet Research Agency (the Troll Factory) was common knowledge going back as far as 2013. It wasn’t much of a secret at all. It was well organized, compartmentalized, sought out perfect English speakers, and well funded. Just like the FSB (the new brand for the old KGB, but same bunch). 1. The Russians adopted false identities and used these false identities to open Social Media accounts at such places like Facebook and Twitter. Wow! Never saw that coming, did you? 2. The Russians used these accounts to stir up trouble (starting years before the election, when it was a high likelihood that Hillary would get the Democrat nomination and Donald J Trump hadn’t even declared his candidacy) by planting false information and inflammatory information. e. an indeterminate amount in Florida which may be as much as $5,000. Read the articles and you will learn they did exactly what any minimally digitally savvy person would suspect they might. They were true agents provocateur. Facebook reported previously that accounts which it suspects of being fraudulent spent as much as $80,000 on FB ads. They are not perfectly certain. Yawn. Oh, excuse me, I guess in a Presidential campaign which spent more than $10,000,000,000 on all ads and events with the two direct campaigns spending a total of $2,000,000,000 directly, I fail to see how the Russians could have really hoped to impact the election. When do the Russians go to trial, Big Red Car? What the Mueller indictment does not say is that none of these people will ever go to trial. Ever. 3. Because Vladimir Putin is not going to agree to their extradition. 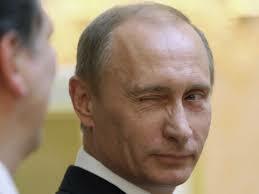 Neither the US nor Russia ever extradites spies. We exchange them, but only when we have custody of them. Pointedly, the Mueller team does not have any of these digital Illuminati in custody. Big point. What Mueller did was to repackage the news from Russia and the Washington Post and craft it into an ineffective, showboat of an indictment by manipulating some “in the dark” Grand Jury as a means of pretending that he had discovered something of value or importance. Unfortunately, the story started three years before the election and the Obama admin knew about it for years. Yawn! Excuse me. It is total baloney and nobody on the Mueller team expects to ever try this case. It is a head fake. So, Big Red Car, why did they do it? Who knows? But, hey, what the Hell do I really know anyway? I’m just a Big Red Car. Happy Presidents Day. Thanks, George! This entry was posted in Russia and tagged internet research agency, mueller, Russians, Trump. Bookmark the permalink. Why? Because the indictments (1) suggested to people not paying any attention that Mueller and the FBI were busy doing good work and (2) were a distraction from the reports, for months, nearly every night on Hannity and Ingraham about dirty, partisan, illegal stuff done by high people at DOJ and FBI under Obama. Also, to many of the people not paying close attention, the indictments took a little of the public relations, political, image heat off Trump and let Trump claim some degree of exoneration. So, that’s some high people at the FBI well on their way to some chain gang in southern Mississippi trying to go easy on, sucking up to, Mr. Big, the Boss Man, The Man. But a pendulum is swinging: The Trump-Russia collusion scam has about run its course. and now the real story is in the second act as AG Sessions announces that there will be investigations. Of who? Sure, Comey, the Obama AG whomever she was, the Clintons, and Obama. Oh, IIRC, Mueller was going to interview Trump!!! Trump said “Bring it on” or some such. Some people said that Trump could do the written Q&A ploy. Then I never heard anymore! So, Mueller’s going to interview Jared??? Would you believe Ms. Stormy Daniels??? Well, we are pretty sure he didn’t interview the Russians. Besides, from the Florida shooting, the FBI looks like a bunch of fools. Sooo, they have a Big One, a big announcement. Well, a little announcement. Okay, a piss to windward. The indictments of the Russians are like trying to teach a pig to sing: It wastes the human’s time and irritates the pig. We suspected that Mueller and much of the top of the FBI are useless clowns; the Mueller indictments removed a lot of any remaining doubt. Besides, the Mueller order was to investigate Trump-Russia, not Russian Facebook spamming. Or, if Mueller soon lets the investigation just die a slow death, then he can always say that he did have a big bunch of indictments. So, he looks busy. Now the Russians and the radical Islamic terrorists have both seen how to sucker the US into total nonsense: The Ruskies got the US media all wound up on a wild goose chase for 18 months or so, creating hostility, avoiding having informed citizens discuss what we really SHOULD do. And the terrorists with just a few guys with box cutters and airplane tickets on 9/11 suckered W & O into throwing $7 T and more lives than were lost in 9/11 against nonsense in the deserts. So, they have the foolish US running around like a dog chasing its own tail, ignoring reality, and going broke, all from the silliest sucker scam going. Head fake and smoke screen? I guess so. Yep, Russia caught red handed dumping their 10k into the system to throw an election with populace of 325 million. Now that’s a story! What I intentionally try and do now when interacting with others who Blame Trump for Everything, is to try and see the other side. With Obama, as much as I didn’t like the guy’s policies, I never dedicated my very existence to entrench myself into mass hysteria about him as a person and always at least considered the other side. And their was conversation. But now, it’s different. The Russia hysteria is at full-tilt once again. When any rational human being would at least admit “ok, not much there but I hope against all hope that Trump’s guilty of something”. Plus, I’d like to think that if I saw one bit of real evidence that collusion occurred and Trump didn’t overtly win the election, I’d admit it and be ok with it. It’s life. Just like we recently got some conformation that he’s got good taste in hookers and picks remarkably beautiful woman to have extra martial affairs with. I hate it, but I’m not going to dedicate my life on Facebook posting articles that’s it’s not true. It’s sad that people cannot even talk anymore. It’s just rabid hatred. No man is either 100% good or bad. Trump has brought in some change. Some good, some not so good. But if you don’t like the guy, please do go get a life. And stop drinking the Russia Kool-aid because your candidate forgot to campaign and her campaign leader was stupid enough to click on a phishing email or two. Yeah, well, what that guy said. Nailed it. OK, so when will the trial for the Russians who tampered with our election on Facebook and Twitter start? It’s all a big head fake.